Spring is here! And what better way to celebrate then with my favorite french brand L'occitane. 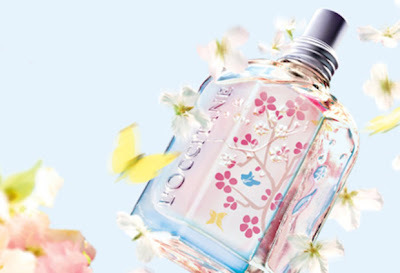 I haven't checked out too much from their collection, but my favorite perfume right now is the new L'occitane fragrance, Cherry Eau' De toilette . ($42) The fragrance begins with a fruity note of mandarin and black currant (two of my favorite smells) followed by cherry blossoms and magnolia. It also contains a rare cherry extract from the Luberon region of Provence. The scent really takes on different levels, at first it's a bit intense and then it dwindles down a soft French smell that lasts all day. Currently it's my favorite perfume in my collection. Perfect for Spring. Aren't they pretty? It includes soap, body gel and hand cream. I'm loving the packaging, no one could say Spring time better. All products are available now at L'occitane's website. LOVE it all! I've been curious about this perfume for a while now. Thanks for the review, I'm going to pick up a bottle ASAP!